wow, just WOW. I envy the time and money you have to make this giant! Good god, what a start, what a start! This job is already outstanding. Great MOC, I hope to see more of you. Only, a little perfectionistic idea , You're saying that it has only 3 gundecks, but actually a 1st rate has 4. Like on this picture. Again, great MOC. Keep on working! The definition of a gun deck is, that you have a continuous battery througout a whole deck. Without any gaps. So the canons astern bunched together don't make a gun deck but are part of the main deck. 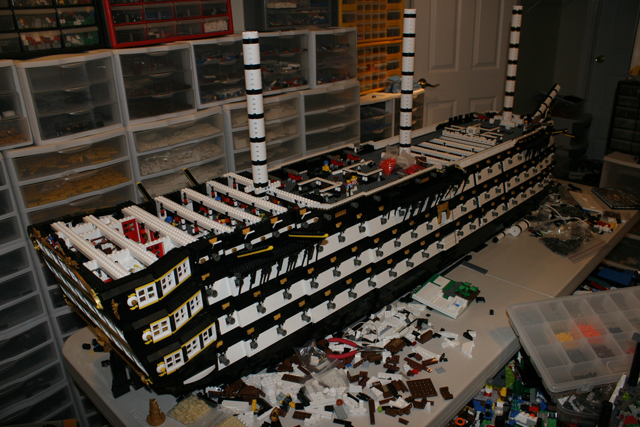 @shiplover But here is another perfectionistic idea:) Maybe a little bit late, because your hull is nearly finished. I think it was said before, but that are just too many canons, even for a first rate:P And according to your ships scale, the gun ports seem to be a little bit tiny. So changing them into 3x3 plates and reduce your firepower down to 120 canons would let your vessel become the most acurate ship building ever. Because only your scale offers the possibility to work on the interior very detailed. So anything I've done in this arena is child's play next to this beauty. 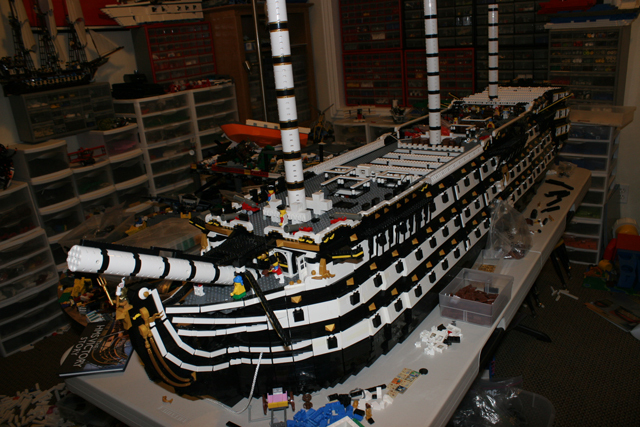 I really can't wait to see it; once finished it's likely to be one of the best LEGO sailing vessels ever built. Magnificent. That actually blows my mind. Still working. Just about ready to put on the poop deck. 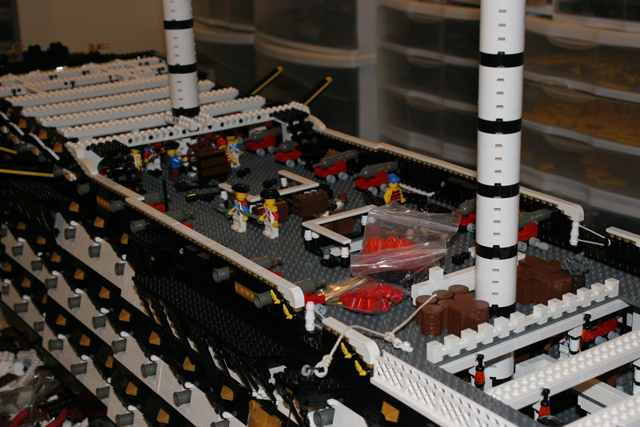 Captain's cabin and dining room are detailed and complete. 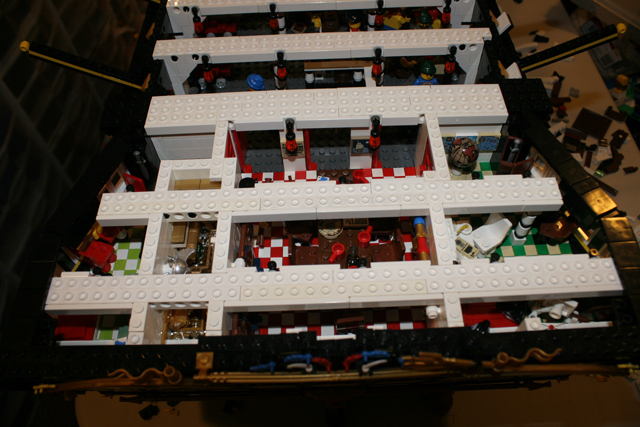 I added a treasure room on the quarter deck next to the Captain's dining room, just could not resist. 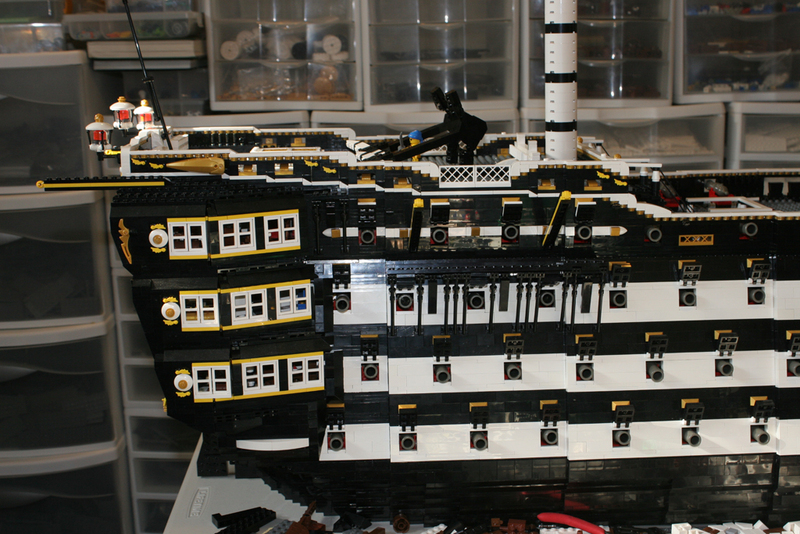 Looking forward to the boats, the poop deck detail, and then onto the masts and sails. Thanks for the ideas and comments on this website. They have been invaluable. Interesting idea on the three by three cannon ports. I ran some numbers and they seem to scale too large at 3x3. Admittedly the 2x2 scale a little small, but I think on balance and considering the extra effort associated with making everything else work with 3x3s (cannon placement and overall lineup), the 2x2s were the right decision. I built a mock-up hull with 3x3 ports and it just didn't look as good as the 2x2s on the mock-up. The ship I'm working on looks like dingy next to this beautiful behemoth. Any progress on this beauty? I have been following this build for some time now. Though the gun count is way too much, I feel that this ship would be a representation of how a ship of the line would have looked if steam powered ironclads had not been invented. 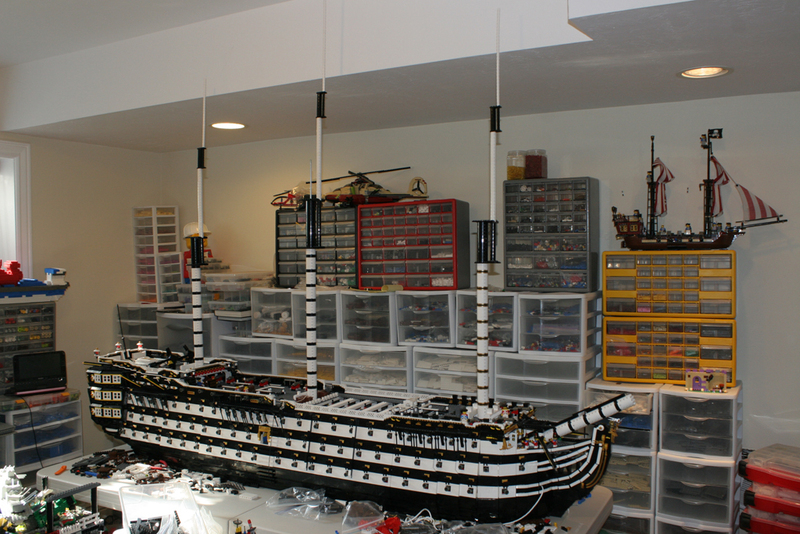 This build reminds me of the Uss Pennsylvania, and a British ship that was not built, but designed Hms Duke Of Kent. Outstanding build, it must have used a LOT a bricks. Are you ever going to put sails on it, the deck is a little open. Still a great MOC. Still working. Here are the latest. wow, just stumbled upon this today, THIS IS MASSIVE! seeing as i don't know much about ships i can't complain about historical inaccuracy. i think this looks great, good luck with the rigging though! WOW this thing is insane!! I can not wait to see more detailed photos of the cabins in the aft of the ship. I love building the cabins most of all, and your detail is looking most impressive. The only thing I would change would be the latticed windows for the boxy ones. The interior of the ship is fully fitted out. I have photos of every deck and every room as the ship was constructed, both before the cross bracing was installed and after. If anyone wants to see photos of anything in particular, just ask and I'll post them. 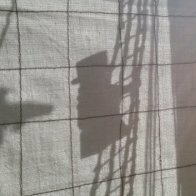 I am starting to think about sails, masts, yards, and rigging. For years I have been perusing the various ships on this site along with others I found to get ideas for these aspects of the ship. If anyone would care to offer ideas and links to pictures for masts, spars, rigging that would suit the scale of this ship, I would appreciate it. 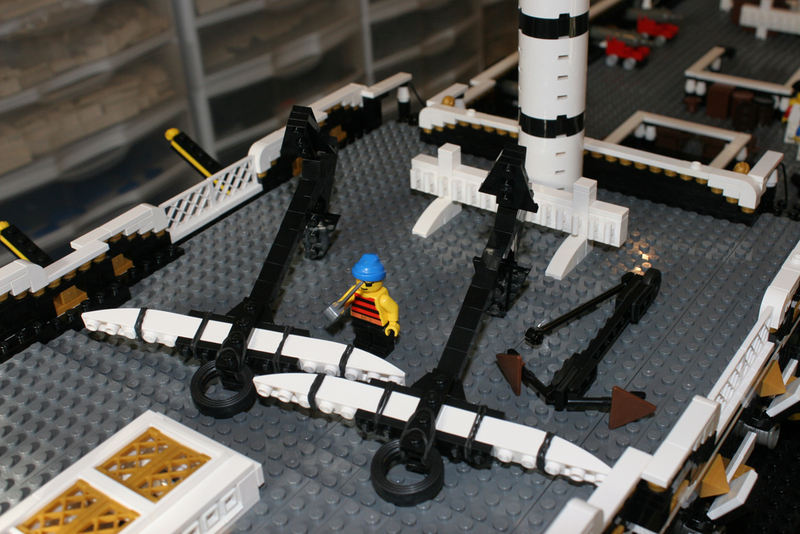 I am also trying to figure out the best configuration for the large lamps on the rear of the ship. I have probably settled in on the design used on the Le Fourageux, but I am open to ideas. 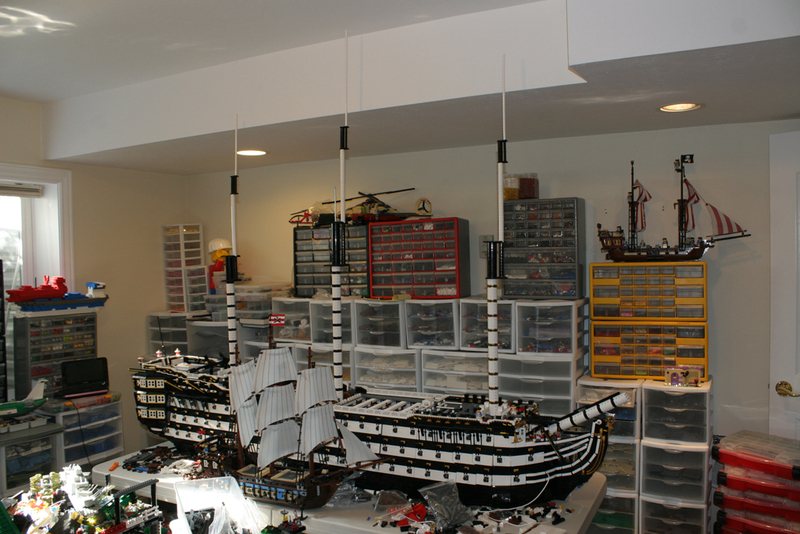 I guess you could even line up every LEGO pirate ship and one broadside would still be enough to finish them all off at once. Great progress! Good luck with the final 'bits'! 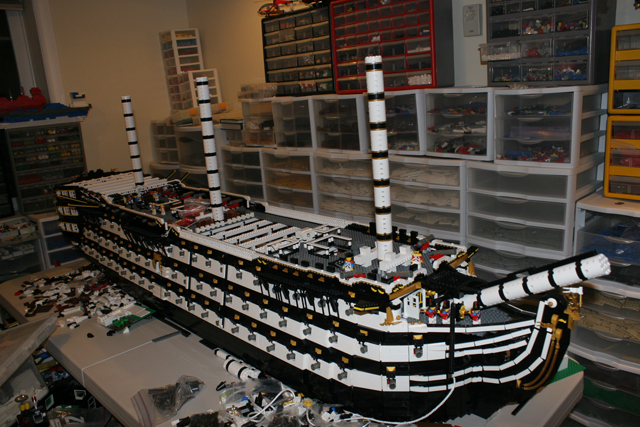 In minifig Scale, the Imperial Flagship would have been a very small ship, maybe a corvette/sloop or similar class. I am curious if there has been any progress/more pictures of this. 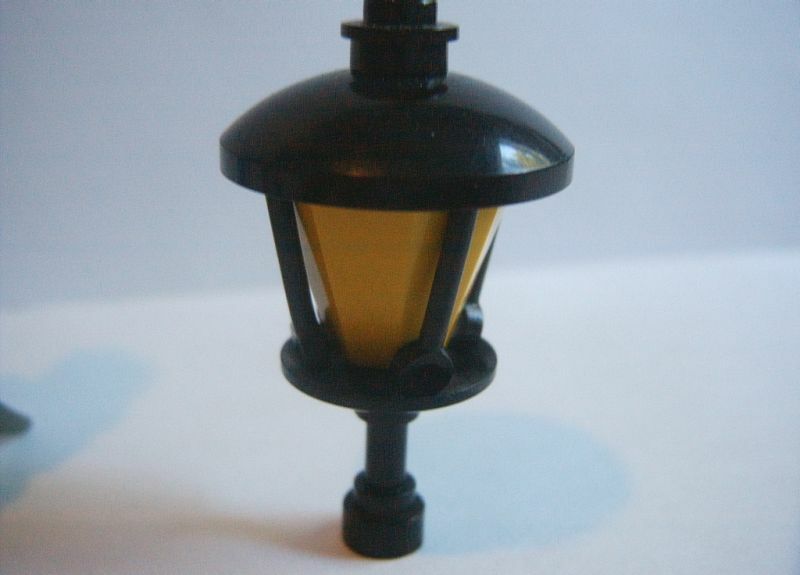 I attempted to make a 74 via LDD but it would be far inferior to this in size and not nearly as proportional as this one. I would especially love to see interior photos. I'll add some interior pictures soon. 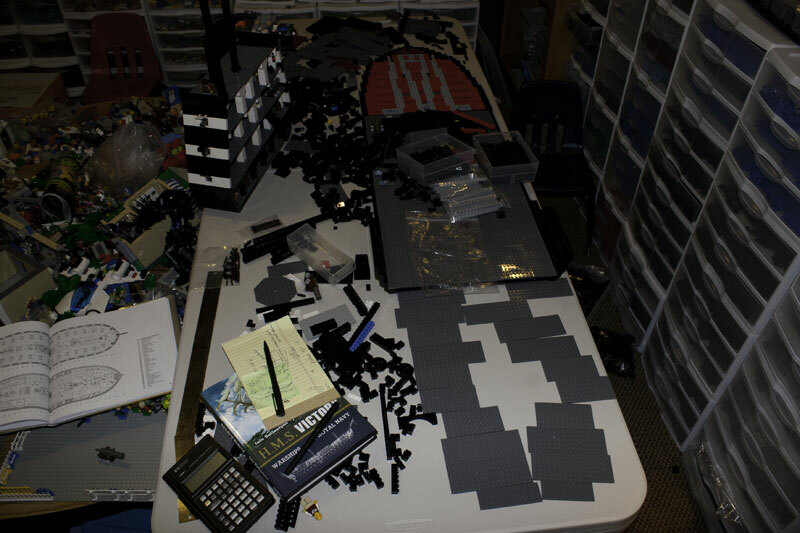 Here is a picture from the very early construction.